Janet Malcolm is probably best known for the opening salvo of her book The Journalist and the Murderer: "Every journalist who is not too stupid or too full of himself to notice what is going on knows that what he does is morally indefensible." This has no doubt inspired a great deal of soul-searching in journalism-ethics classes, but it gives an erroneous impression of Malcolm. Janet Malcolm is not (usually) the sort of journalist who poses as the scourge of God. She is a camera. It's probably not a coincidence that nearly a third of the essays in her new collection, Forty-One False Starts: Essays on Artists and Writers, concern photography and photographers, ranging from the Victorian pioneer Julia Margaret Cameron to Diane Arbus to Thomas Struth, a German who specializes in oversize photos and who two years ago shot an enormous portrait of Queen Elizabeth and Prince Philip. "Photography is a medium of inescapable truthfulness," Malcolm writes in her profile of Struth. "The camera doesn't know how to lie. The most mindless snapshot tells the truth of what the camera's eye saw at the moment the shutter clicked." But, she adds, one of the roles of the photographer is to provide the setting the way Struth (in his portrait of the Queen) selected the suit she would wear ("many of the dresses she wears are quite unfortunate," he tells Malcolm) and repositioned a badly placed pillow behind her. Malcolm's work requires a long exposure time. She argues in "A House of One's Own", her essay on Bloomsbury, that Quentin Bell is the best-qualified person to write the biography of his aunt, Virginia Woolf, because "he knows [the family's] members very well. He has carefully studied each of them for years; he has slowly turned their characters over in his mind for years." 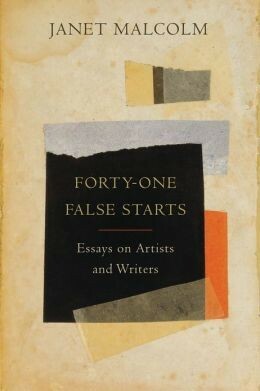 For the longest piece in Forty-One False Starts, "A Girl of the Zeitgeist", originally published in 1986, she followed the ostensible subject, Ingrid Sischy, who had become editor of Artforum in 1979 at the age of 27, for more than a year—though the story itself is less about the girl than the zeitgeist of the New York art world of the mid-80s as told through the various self-absorbed characters (both critics and artists) in Sischy's orbit. Malcolm's pillow positioning here is nearly invisible. In her telling, she appears to wander through downtown Manhattan as a stand-in for the reader, trudging up to various lofts to listen to their inhabitants speak at length about Artforum and Sischy and the changing of the guard in the art world. At one point, Malcolm watches Sischy herself, an editor who had almost no experience when she took over Artforum but who will work late into the night "ministering" to her writers, chop tomatoes with a paring knife "with agonizing slowness . . . Obviously, no one had ever taught her the technique of chopping vegetables, but this in no way deterred her from doing it in whatever way she could or prevented her from arriving at her goal." Sometimes Malcolm's not quite as invisible. When Struth makes an ill-advised reference to Proust, she gets him to admit that he's never actually read Proust. Struth is a sophisticated and practiced subject of interviews. He had recognized the Proust-Atget moment as the journalistic equivalent of one of the "decisive moments" when what the photographer sees in the viewfinder jumps out and says, "This is going to be a photograph." I made reassuring noises, but I knew and he knew that my picture was already on the way to the darkroom of journalistic opportunism. Malcolm maintains this level of precision and high focus even for subjects who are not considered high art, most endearingly in her review of the Gossip Girl series of books—not the TV show—where she notes that there are no scholarship students in this fictional Upper East Side, except for a lone gum chewer from the Bronx who appears on page 86 of the first book and is never seen again. And then, just as endearingly, she praises the complications and contradictions that make Blair Waldorf a much more interesting character than her rival, Serena van der Woodsen: "Her over-the-top selfishness and hatefulness has the ring of behind-our-masks-we're-all-like-that truth." 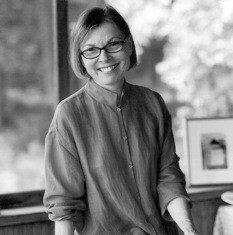 In the book's final essay, "Thoughts on Autobiography from an Unfinished Autobiography", Malcolm writes that she lacks the self-forgiveness necessary to write about her younger self. "I see that my journalist habits have inhibited my self-love. . . . In what follows I will try to see myself less coldly, to be less fearful of writing a puff piece." The autobiography was never written. It's just as well. We already have too much self-forgiveness. It's much more interesting to read the work of a writer who can see clearly and who trusts that her readers are just as equipped to look at books and art as she is.